Ira Gleser, the founder and president of Amplify Marketing Communications, a B2B marketing communications firm, published a wonderful article about Custom Nation on February 9. In an article titled, “How to Engage Millennials Through Customiztion and Curation,” Gleser discusses Custom Nation through his experienced lens. Gleser has worked in management, leadership and consultative roles with companies such as Coca-Cola, MGM Mirage, Burger King, Charles Schwab, Tyson Foods and Lowe’s. Custom Nation in the News! We’re delighted to share that Anthony Flynn was a keynote speaker at the Food Manufacturing Institute’s annual conference in Florida last month. One of the most interesting sessions at this year’s Food Marketing Institute Midwinter Conference in Miami this week was “Built for Yesterday, Facing Tomorrow: Food Retail’s Engagement of the New Consumer.” Presented by Anthony Flynn, CEO of YouBar and author of Custom Nation, the premise was that grocery retailing is an industry grounded in the delivery of mass produced goods through bricks and mortar locations. It has a very long history of customer service and of striving to provide the best value for shoppers…. To read more 2015 predictions, check out Baum + Whiteman’s full report HERE. Customization continues to be one of the biggest buzz words in retail. The latest proof? The National Retail Federation’s Jan 11-14 annual show in New York City, where moderator and senior partner of retail consultancy Ebeloft USA, Neil Stern, gave a seminar titled “Global Retail Innovation,” which focused heavily on the need for retailers to add increasing levels of customization in order to stay relevant. Forget being one in a million. Dodge has just launched a brand new customizing process for its 2015 Viper that sets the number of possible designs at an awesome 25 million! 3D food printers, which allow chefs to ‘print’ out dough and other food materials in completely customized patterns — think a wedding cake with the couple’s name engraved inside each slice — have long held great promise. But, they’ve been prohibitively expensive… until now. 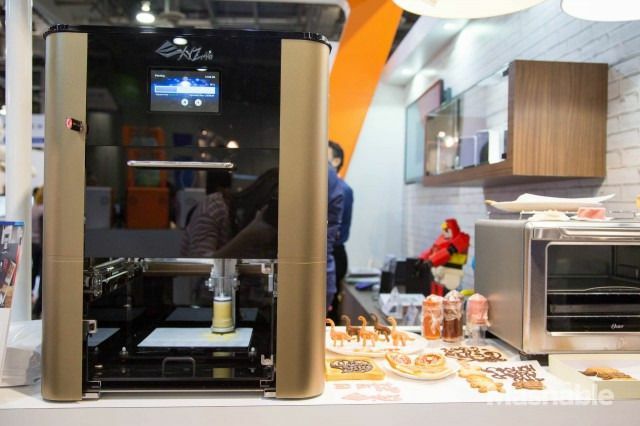 XYZPrinting has just introduced a 3D food printer that costs less than $2,000. It can create customized dough-based foods — from pastries to cookies. And, at this price, those bakery goods smell pretty sweet! Fast food was one of the first big industries to embrace customization wholeheartedly — from Burger King’s “Have It My Way” hamburgers to make-your-own-burrito Chipotle and make-your-own-sandwich Subway. But McDonalds has long been a bastion of old-fashioned ordering from a fixed menu. “Responding to declining same-store sales, falling stock prices and a shrinking base of younger customers, the world’s largest fast-food chain will announce plans to vastly expand its “Create Your Taste” test platform. Create Your Taste lets customers skip the counter and head to tablet-like kiosks where they can customize everything about their burger, from the type of bun to the variety of cheese to the many, gloppy toppings and sauces that can go on it. My take on it? Better late than never, Ronald! It’s no surprise that inventors and businesses are rushing to get as many patents as they can. 3-D printers enable manufacturers to produce customized items at a fraction of the cost of traditional manufacturing. This has obvious applications for companies that make things that must be customized – like prosthetic limbs. 4 of top startups from #500 Start ups Preview Day. I got to get a sneak peak at the batch 10 #500 Start Ups companies prior to Demo Day, Oct 21st. Its really cool to see a group of businesses that are growing quickly and helping one another along the way. Of the 20+ companies I saw, there are 4 that really stood out. If I had $100M… this is where I would invest it… All 4 have great teams, are in big marketplaces, but most importantly…They have some great traction! MyTips – User Onboarding as a Service. UXCam – collaborative user testing platform. UXCam pinpoints the usability issues and lets you watch videos of your users interacting with the app to collaborate and improve user experience of the app. Rover – Unlocking the potential of beacon hardware for marketers. RAIN – Grows Local Businesses. For a start up to have over 10,000 businesses who already onboard…thats a great start! Nike has long been a customization leader with its line of totally customizable sneakers, dubbed NikeiD. Now, the company has partnered with photo-sharing service Instagram to allow users to create their own sneakers with an even more unique element of customization. Through the new service, Nike PHOTOiD, users can customize Air Max sneakers with the color palettes from their most cherished Instagram photo moments. Forget wearing your heart on your sleeve. Now, it’s all about wearing your favorite moments on your feet.